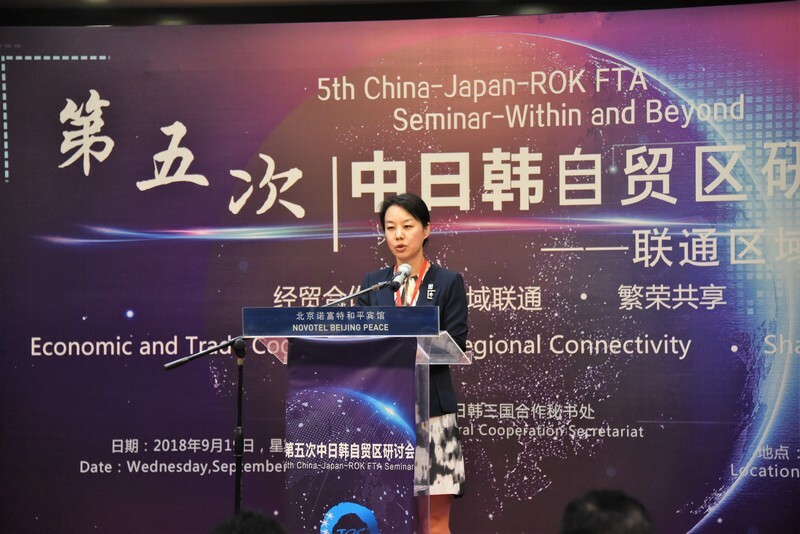 Trilateral Cooperation Secretariat (TCS) held the 5th China-Japan-ROK (CJK) FTA Seminar on September 19, 2018 in Beijing, China. 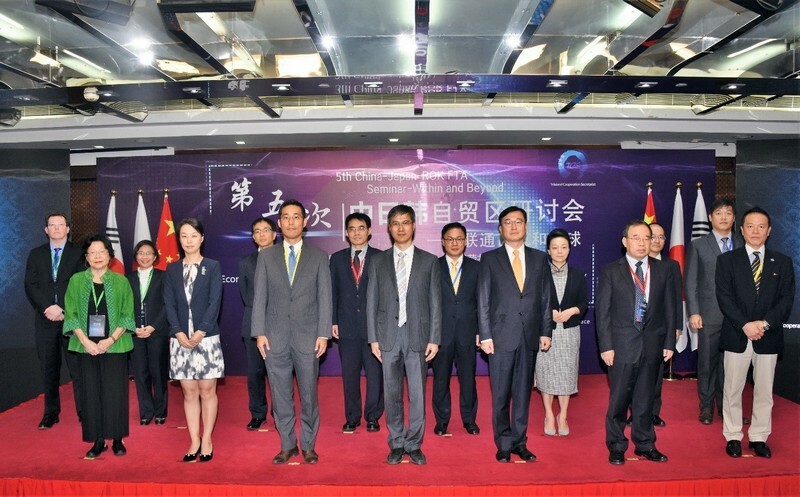 Government officials, representatives from business sectors, scholars from the three countries and scholars from Asia-Pacific countries gathered to discuss the future direction of CJK FTA and regional economic cooperation. Mr. YANG Zhengwei, Deputy Director-General of the Department of International Trade and Economic Affairs of the Ministry of Commerce of China; Mr. KIM Jeongil, Director-General of the FTA Policy Bureau of the Ministry of Trade, Industry and Energy of the ROK; and Mr. HAYASHI Kazutaka, Counsellor of the Economic Section of the Embassy of Japan in China attended the Seminar and delivered remarks. Over 100 representatives from government, private sectors, academia and media participated in the Seminar. Ms. HAN Mei, Deputy Secretary-General of the TCS delivered opening remark. She acknowledged the fruitful results that the three countries had achieved in economic and trade cooperation, and emphasized that the establishment of CJK FTA would create a mega market for the three main economies in the world. She mentioned that the 7th Trilateral Summit laid a positive foundation for accelerating the process of CJK FTA and RCEP, and hoped all relevant countries seize the momentum to move forward the two important negotiations. 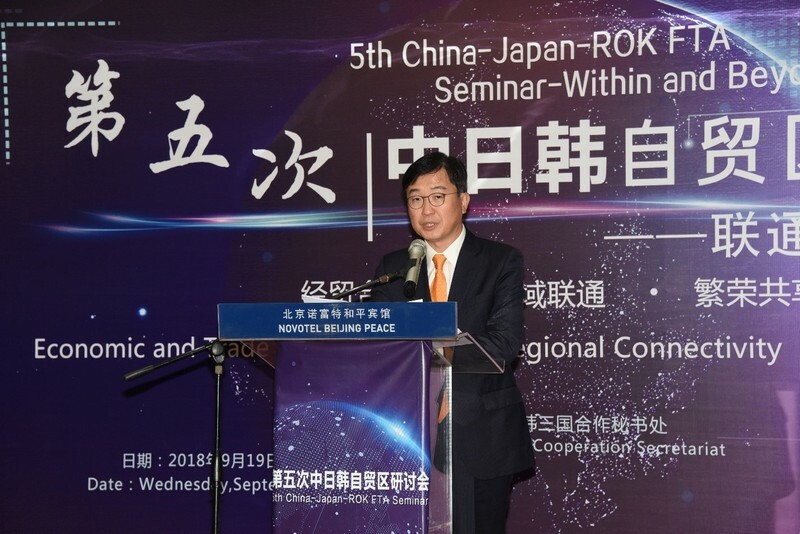 Mr. YANG Zhengwei spoke highly of the significant role that CJK FTA plays to realize high-quality economic integration and indicated that accelerating CJK FTA would help the three countries fight against unilateralism and protectionism. Mr. KIM Jeongil underlined that CJK FTA would contribute greatly to advocate open and free world trade. He encouraged the three countries actively find mutual interests and deepen cooperation in the framework of FTA. Mr. HAYASHI Kazutaka pointed out that CJK were main economies of Asia and the world and Japan would continue to work with China and the ROK to move forward CJK FTA and RCEP. 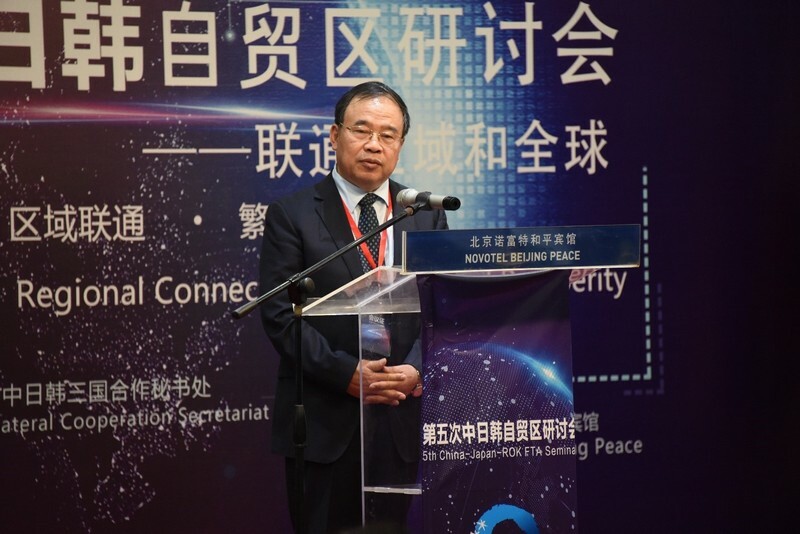 Mr. ZHAO Jinping, Research Fellow and Former Director-General of the Research Department of Foreign Economic Relations of Development Research Center of the State Council (DRC) delivered the keynote speech themed “Accelerate the Process of CJK FTA in the New Global Context”. In his speech, he pointed out that FTA had become a shared understanding worldwide in terms of achieving bilateral and multilateral cooperation. High-standard FTA would promote openness of markets and stimulate economic growth. Mr. ZHAO suggested that CJK should accelerate the process of CJK FTA via a more pragmatic, reasonable, and flexible approach. The three countries should focus on the needs for long-term regional stability and economic development to establish FTA and deepen cooperation in relevant areas. Mr. YAMAMOTO Yasushi, Deputy Secretary-General of the TCS facilitated the first session of the Seminar. 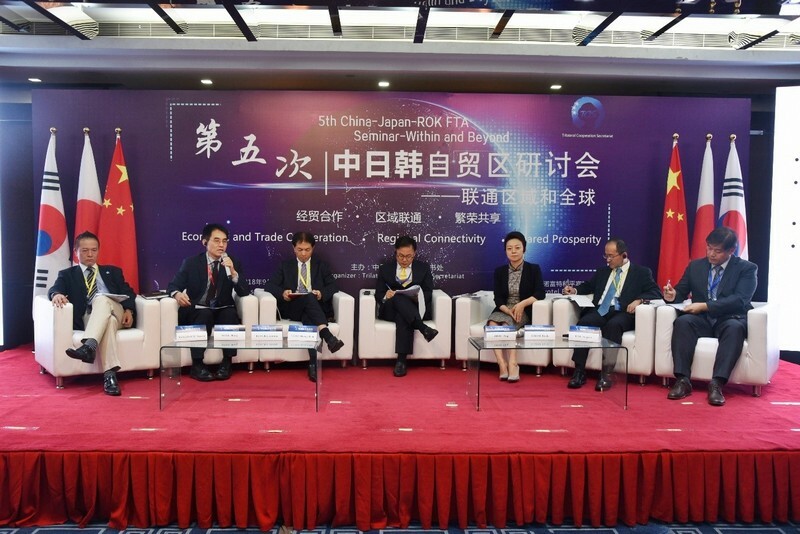 Distinguished scholars from China, Japan, and the ROK analyzed the CJK FTA process and provided suggestions. Dr. SONG Hong from Chinese Academy of Social Sciences underscored that the three countries should be practical and achieve CJK FTA from phase to phase. Dr. TAMURA Akihiko, professor of National Graduate Institute for Policy Studies believed that the establishment of FTA was a result of high demands of multilateralism. The realization of CJK FTA would not only promote trilateral economic cooperation but more importantly, promote regional stability. He suggested that the three countries should steadily promote CJK FTA hand-in-hand with other trilateral cooperative agendas. Dr. JEONG Hyung-Gon from Korea Institute for International Economic Policy indicated that the realization of CJK FTA would be a win-win-win outcome for the three countries which would bring more benefits compared to bilateral free trade agreements. Therefore, the CJK FTA should be carried forward further. During the discussion, Dr. ZHAO Ping from CCPIT Academy, Mr. SEKINE Eiichi from Nomura Institute of Capital Markets Research, and Mr. KIM Dongsoo from Korea Institute for Industrial Economics and Trade shared their point of views from industry side. In the second session, regional partners shared their views. The session was moderated by Dr. TU Xinquan, Dean and Professor of China Institute for WTO Studies, University of International Business and Economics. Dr. CHIA Siow Yue, Senior Research Fellow of Singapore Institute of International Affairs introduced ASEAN Economic Community. She expressed her perspective that differences caused by non-economic factors could, to some extent, drive countries to cooperate in economic and trade. Dr. THAM Siew Yean from ISEAS-Yusof Ishak Institute of Singapore and Universiti Kebangsaan Malaysia introduced the background and process of RCEP. She mentioned that the process of the current free trade agreement could be based on existing cooperation, such as financial cooperation including Chiang Mai Initiative. Dr. Remy Davison, Jean Monnet Chair in Politics and Economics of Manash University focused his speech on regionalism and gave out examples around the world as reference. He suggested that FTA could begin with consented part first and then later for more comprehensive ones. 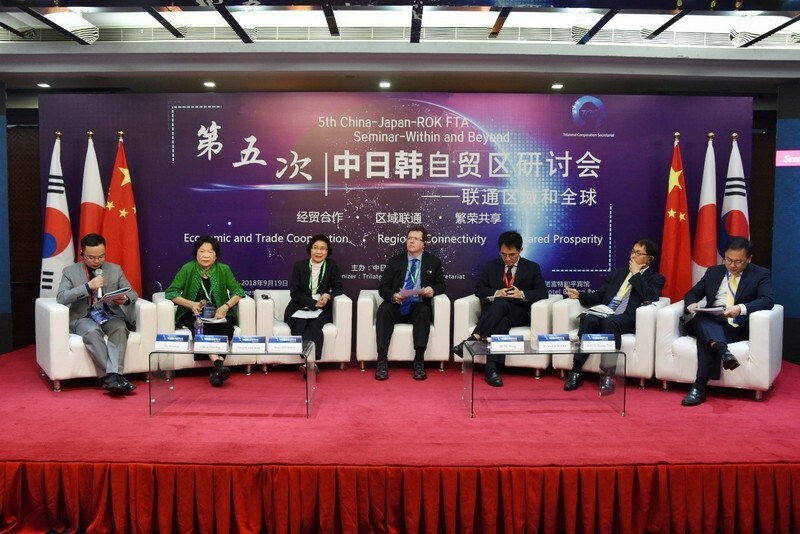 During the Seminar, experts from CJK and Asia-Pacific region had a good discussion and provided meaningful reference to the realization of CJK FTA and regional economic integration. The Seminar left a positive atmosphere for continuous communication on CJK FTA and regional cooperation. The CJK FTA Seminar is one of the most important events that the TCS holds to promote trilateral economic cooperation. 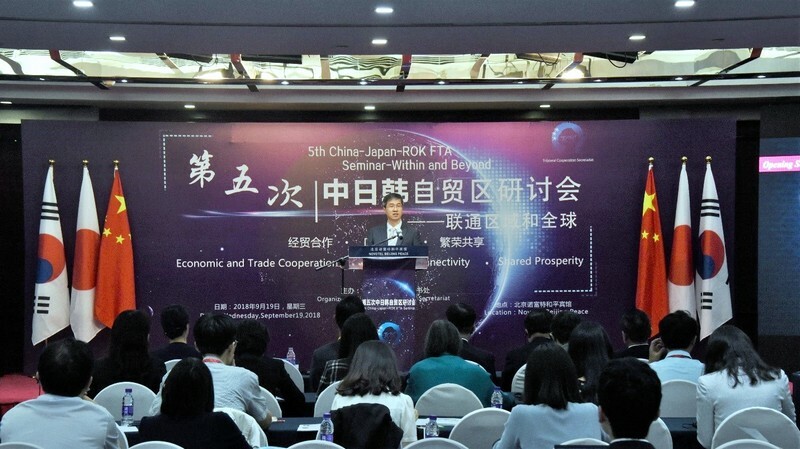 So far, five seminars were held to provide advice to CJK FTA and promote public’s understanding of CJK FTA and economic cooperation.